This series is primarily concerned with the publication of source material on the language, history and culture of the Khoisan speaking population of Africa. It furthermore provides a forum for the presentation and discussion of analytical linguistic studies. The series will appear at irregular intervals and comprises both monographs and collections of papers. Author: Anthony Traill †. Edited by: Hirosi Nakagawa, Anderson M. Chebanne. With a preface by: Jill Traill. Edited by: Anne-Maria Fehn. In collaboration with: Falko Berthold. With contributions by: Falko Berthold, Gertrud Boden, Anderson M. Chebanne, Chris Collins, Edward D. Elderkin [show more…], Anne-Maria Fehn, Linda Gerlach, Bernhard Köhler, Wilhelm J.G. Möhlig, Hirosi Nakagawa, Christian J. Rapold, Bonny Sands, Sheena Shah, Christoph Wirsching. Edited by: Sheena Shah, Matthias Brenzinger. With contributions by: Gertrud Boden, Chris Collins, Edward D. Elderkin, Wilfrid H.G. Haacke, Bernd Heine [show more…], Henry J. Honken †, Ulrich Hummel, Blesswell Kure, Christa König, Adam Lammert, Timothy K. Mathes, William B. McGregor, Kirk Miller, Shrikanth Narayanan, Michael Proctor, Bonny Sands, Asterios Toutios, Yinghua Zhu. Author: Bernd Heine, Christa König. Author: Chris Collins, Jeffrey S. Gruber †. Edited by: Alan Barnard, Gertrud Boden. With an introduction by: Alan Barnard, Gertrud Boden. With contributions by: Alan Barnard, Gertrud Boden, William B. McGregor, Hitomi Ono, Akira Takada. Edited by: Alena Witzlack-Makarevich, Martina Ernszt. With contributions by: Roger M. Blench, Matthias Brenzinger, Anderson M. Chebanne, Edward D. Elderkin, Wilfrid H.G. Haacke [show more…], Henry J. Honken †, Roland Kießling, Bernhard Köhler. Author: Chris Collins, Levi Namaseb. 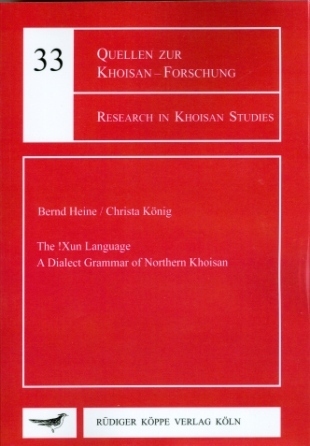 Edited by: Matthias Brenzinger, Christa König. With contributions by: Herman M. Batibo, Matthias Brenzinger, Anderson M. Chebanne, Edward D. Elderkin, Tom Güldemann [show more…], Wilfrid H.G. Haacke, Henry J. Honken †, Christa Kilian-Hatz, Christa König, Amanda Miller, Hitomi Ono, Bonny Sands, Hessel Visser. Edited by: Sonja Ermisch. With contributions by: Matthias Brenzinger, Anderson M. Chebanne, Helen Eaton, Edward D. Elderkin, Mats Exter [show more…], Wilfrid H.G. Haacke, Henry J. Honken †, Roland Kießling, Christa König, Patricia Lepekoane, K.C. Monaka, Christfried Naumann, Akira Takada. Author: Patrick J. Dickens †. Edited by: Rainer Voßen, Megan Biesele. Edited by: Mathias Schladt †. With contributions by: Megan Biesele, Matthias Brenzinger, Edward D. Elderkin, Tom Güldemann, Wilfrid H.G. Haacke [show more…], Bernd Heine, Henry J. Honken †, Christa Kilian-Hatz, Karsten Legère, Amanda Miller, Hirosi Nakagawa, Emmanuelle Olivier, Bonny Sands, Mathias Schladt †, Sigrid Schmidt, Jan Winston Snyman †, Anthony Traill †, Yvonne Treis, Hessel Visser, Rainer Voßen, Thomas Widlok. Author: Siegfried Passarge. Translated by: Edwin N. Wilmsen, Leander Gloversmith, Caroline Jeannerat, Klaus Keuthmann. Edited by: Edwin N. Wilmsen. Author: Hans-Joachim Heinz †. Edited by: Klaus Keuthmann. Author: Patrick J. Dickens †.